I have a problem regarding the implementation of Death Floor in my levels. Sometimes it happens, that I can't enable Death Floor in a certain level anymore after importing it several times. ​Importing my level over Bob-Omb Battlefield with Death Floor enabled. ​Trying the level and the Death Floor works as intended. ​I change certain aspects of my level in SketchUp and export the .obj file. ​Importing my level over Bob-Omb Battlefield with the exact same settings as before. ​Trying the level now I see my changed level ingame, meaning the level has been imported, but the Death Floor no longer works. There's invisible walls again on the ledges where Mario should fall off. I also get an error message whenever I select my .obj file, this might be the reason why I have this problem. But this message pops up every time I select an .obj file. I hope somebody can help me with this, because it's very frustrating! That's kinda' weird with the OBJ Importing, what OBJ-Exporter do you use? (<-- If you use blender as map editing, ignore the question.) Also did you forgot to enable Enable Death Floor? That's mostly disabled by default. Also make sure you don't update any SM64-Editing Programs, since this will result neither to a Reset of your rom, or some corruptions (by my expirience). I was using a plugin up until yesterday, but now I am using the built-in option for exporting obj. files in Sketchup 2018 Pro. Yes I check everytime if Death Floor is really enabled. I am using SM64 Editor 2.2.3 and Toad's Tool 0.6.8S and I never changed the versions of these programs working on my current project. Well, the error on the 'Collision' tab doesn't mean something special, it is just an Error that the editor can't handle a color value over 255 (If it appers like 8xxxxxxxxxx...? ), still everything will work. But if you're unlucky, you can't edit some Collisions after you get this error. By the way, the textures won't disapper. Also, did you recently use a Tweak? 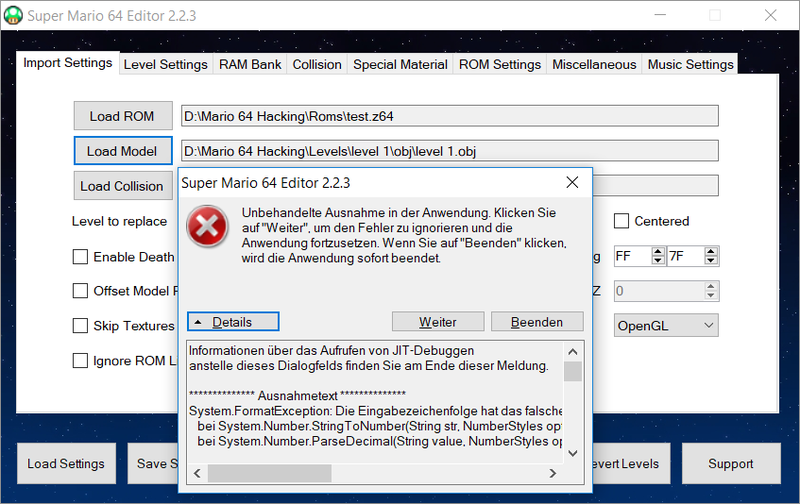 All I did is open a vanilla rom in SM64 Editor and it applies the patches necessary automatically. The Extend Level Boundaries Tweak might be a problem. You can revert it, but how exactly... I don't know. As my expirience, I can't use TT64 anymore after I applied the Tweak, and the Error messages apper too. I can't really guarantee that is this problem after all, you might want to get somehow help by others. Maybe do you want to join the Discord Server? I am not quite sure if the Extend Level Boundaries Tweak casues my issue, because this tweak was activated from the start. But I would love to join the server!